Leave bond undisturbed for 10 seconds after application; dry for 5 seconds. 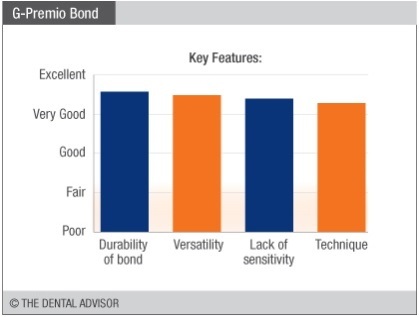 G-Premio BONDTM is a universal (8th-generation), single component, light-cured bonding agent. It is compatible with total-etch, self-etch and selective-etch techniques and indicated for use in all classes of direct restorations. 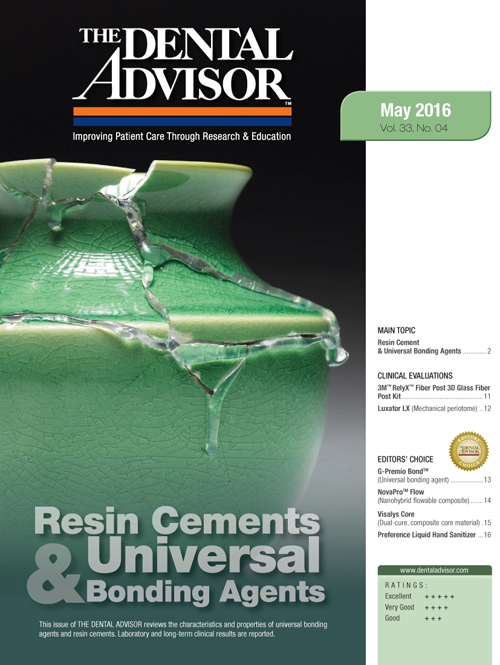 The addition of an MDP monomer enhances chemical adhesion to zirconia, alumina and other non-precious metals; increased water content improves removal of the smear layer; and increasing the amount of carboxylic monomer maintains an acidic pH. 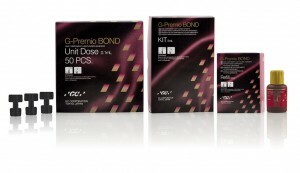 G-Premio BOND is recommended for use in the following indications: direct bonding of light-cured composites and compomers to tooth structure; intraoral repair of composite; metal-based and zirconia/alumina-based restorations, in combination with G-CEM LinkAceTM resin cement for the bonding of indirect restoration where light curing is possible; treatment of hypersensitive teeth; and sealing of tooth preparation (cavity or abutment) for indirect restorations. 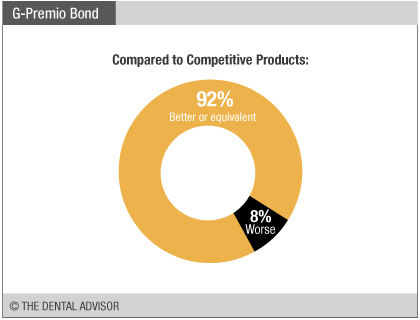 G-Premio BOND can also be used in combination with a silane coupler when repairing glass or hybrid ceramic. It is ideal for use in indirect indications with its very low film thickness (3 µm). It is available in a 5 mL bottle with a new silicone cover to enable more precise drop-by-drop dispensing to eliminate waste and to insulate the bottle from heat generated in the hands. It is also available in 50-count unit-dose packs (0.1 mL each). Curing times is 10 seconds for most lights and 5 seconds for lights over 1200 mW/cm2. 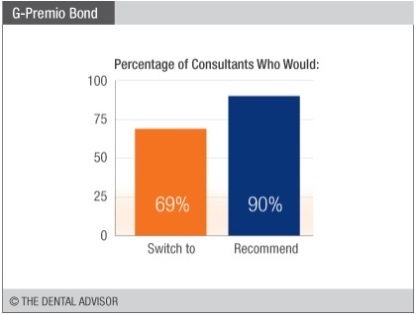 G-Premio BOND unit dose was evaluated by 39 consultants in 1131 uses. This universal bonding agent received a 96% clinical rating. G-Premio Bond is a universal bonding agent that provides a quick technique, with a 10-second soak with no scrubbing required. It is compatible with all etching techniques and can be used with dual-cured composites, provided that light curing is initiated. The unit dose container has a wide enough opening to accommodate all brushes, and the cap can be closed to eliminate evaporation of the solvent during the procedure. The viscosity of G-Premio BOND wets the tooth well, and the acetone solvent dissipates quickly with air. 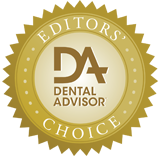 Overall, G-Premio BOND is easy to use and effective for adhesive restorative procedures.